There are a lot of beers released every week. It’s impossible to keep up with them all, but here are some of the most notable that were sent our way this week. Brewers, if you are annoyed your latest creation wasn’t included, you can only blame yourself. Send your beer and brewery news to [email protected] for possible inclusion. If it’s still not on the site, then OK, you can blame us. Caught a couple wild ones in our beer trap. A Dogfish exclusive made from a complex mix of nutrient-packed superfoods may have resulted in the healthiest beer on record. This is definitely not a claim the brewery is making, but we feel comfortable making that reckless speculation. Just check out the ingredients bill for It’s The End of the Wort As We Know It, a Belgian-style fruit ale is chock full of essential amino acids, micronutrients and vitamins. According to independent, third party lab data, Dogfish Head found that It’s The End of the Wort As We Know It contains more than eight times the amount of Vitamin B Complex than one of America’s best-selling light lagers, including over 90 percent of the daily recommended serving of folic acid. To make this off-centered ale, Dogfish blended an intensely fruity mixture of blueberries, acai and goji berries along with an assortment of ingredients including purple sweet potatoes, rose hips, chia seed, flax seed, spelt, oats and quinoa. To keep the survivalist theme going, the special edition 750-ml bottle includes all the essential necessities needed to potentially outlast the apocalypse, such as a limited-edition Dogfish branded Swiss army knife tied to the neck of the bottle which will aid in opening your beer bottle or whittling a fishing spear to capture a conch for dinner. The bottle itself comes snuggly wrapped in a big’ol solar blanket you can use to protect your beer (we mean body) from changes in the weather. Lastly, you’ll find a length of paracord securing the blanket to the bottle which can come in handy if you need to make a tourniquet or if you accidentally drop your survival beer in quicksand and need to quickly jump in to heroically retrieve it. Safety first. Officially the greatest photo posted in the history of this website. The collab brew is aptly named the Experimental J-Hole, a Red IPA clocking in at 7 percent ABV, 60 IBU. We know you often head down the rabbit hole, and you love a good wormhole, but we now encourage you to fall down the J-Hole. The brewmance began with a mutual respect for the lupulin arts, refined in Melvin’s brew temple high in the Tetons of Jackson Hole, Wyoming. Reunited at sea level, we form like Voltron to bring you this unique IPA. An avalanche of hops swarms the palate with malts soft as powder, balancing out this spectacular brew. Overall this is a very complex Red IPA that is atypical in that there are no cloying caramel flavors to get in the way of the hops. The El Dorado hops play first chair with candied cherry notes, while the Simcoe adds bass notes of resin, pine and blood orange, and the Centennial ties everything together in a neat little bow with medium notes of citrus. It features a high hop aroma with upfront stone fruit, candied cherry, hints of citrus (blood orange) and medium-high supporting piney and resin-y notes. There are light “dank” undertones, and the malt aroma is medium-low with a hint of bread and graininess, with low fruity esters. Appearance is slightly hazy, light copper with ruby highlights. You’ll discover a medium persistent off-white head and medium carbonation, lending a medium-light bodied mouthfeel. With low alcohol warmth, there’s a touch of lingering astringency that does not detract from the overall qualities of the beer. It’s got a dry finish, slightly grainy and a hint of lingering bitterness, without being coarse in its medium-high hop and upfront cherry flavor. We’d even drink the cartoon. 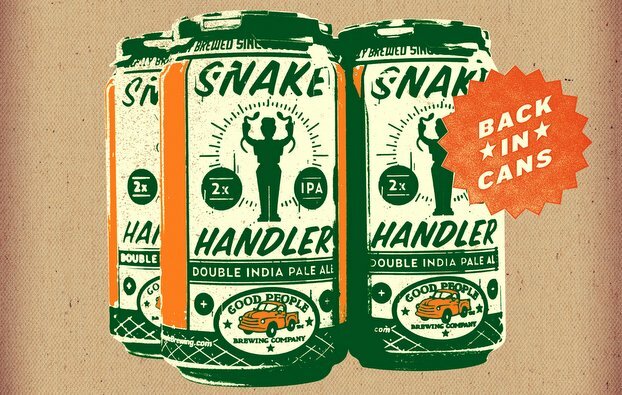 Good People Brewing Co., the oldest and largest brewery in Alabama, will be releasing Snake Handler in cans beginning next week. Good People says Snake Handler, a double IPA at 10 percent alcohol by volume (ABV), is one of the brewery’s most requested beers. This dangerously drinkable brew is well balanced with five specialty malts working together with an aggressive hop profile featuring Columbus, Warrior, Cascade, Simcoe and Chinook. Fresh is best when consuming this double IPA. This beer is dry hopped to add strong aromas of pine, citrus, flowers, spice, pineapple and grassiness. Due to this process, Snake Handler is best experienced as close to the canned date as possible. This beer is available year-round on draft, but only available for a limited time in 12-ounce can four-packs across the brewery’s distribution footprint — Alabama, Georgia, the Florida Panhandle and Tennessee. The beer should hit store shelves starting January 15. Raspberry Chipotle Brown Ale (5.9 percent, 24 IBUs) is brewed with fresh raspberry and jalapeño. The beer overflows with fresh fruit and a distinct, earthy pepper within a robust, malty brown ale. The generally temperate Brown Ale style enjoys prominence among the two assertive ingredients, raspberry and chipotle (smoked, dried jalapeño). Hoppiness is kept in check while the spicy, sweet and smoky flavors play off each other with graceful deference. Sam Weller healthy beers are a thing!